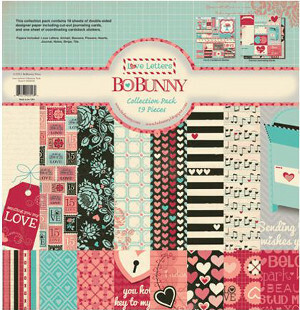 The Love Letters Collection Pack from BoBunny is a whimsical selection of scrapbooking supplies that features a love theme. The different designs are composed of hearts and sweet phrases, perfect for making Valentine's Day pages, or a scrapbook feature of your special someone. You could also make a few handmade Valentine's with this scrapbooking kit, which includes 18 sheets of scrapbook paper, a set of journaling cards, and a full sheet of cardstock stickers. This collection would be perfect for any holiday scrapbooker that is looking for a cute paper set to use during February. The Love Letters Collection Pack includes 8 different designs by BoBunny. 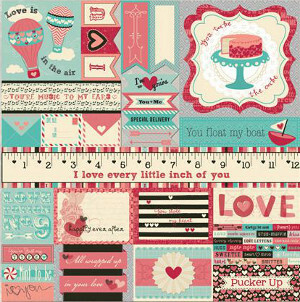 The Love Letters design, which this collection gets it's name from, is covered in a layer of playful stamps that give off a vintage feel. Love Letter Keys, a second design included in this set, is a similar style that feature vintage skeleton keys with little hearts serving as their handles. Each one of these fun designs would be perfect for any scrapbooker looking to add a little love to their book. The full sheet of journaling cards follows the same love theme, giving you the perfect spot in your scrapbook to write down special love notes to your sweetheart. These journaling cards could help you make a personalized valentine in no time at all. The final sheet included in this lovely scrapbook collection is a full sheet of cardstock stickers. These fun and fanciful stickers feature sweet sayings, pretty hearts, and other cute motifs. With this many stickers, you wont have any trouble decorating your pages. With paper, journaling cards, and stickers all included in this collection, you will have all that you need to start a few pages dedicated to the holiday of love or to someone you love. The Love Letters Collection Pack is the complete package.